In this Photoshop Effects tutorial, we're going to learn how to make it look as if the subject of a photo is popping right out of the image. 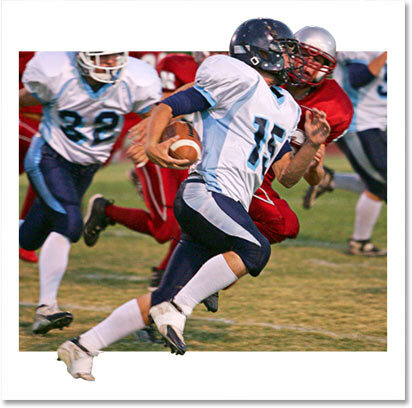 Not only is it a great way to add interest to a sports photo, a wedding photo, product shot, or even a photo of your kids playing in the backyard, it also happens to be very easy to do, as we'll see. Hold down "Ctrl" (Win) / "Command" (Mac) and click the "New Layer" icon. 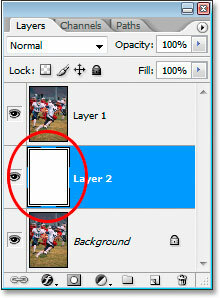 The new blank layer is added between the Background layer and "Layer 1". 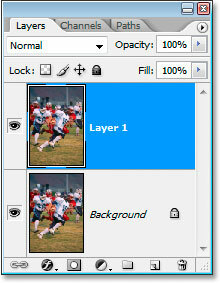 Click back on "Layer 1" in the Layers palette to select it. Then, using the selection tool of your choice, make a selection around the object(s) you want to have popping out of your photo. 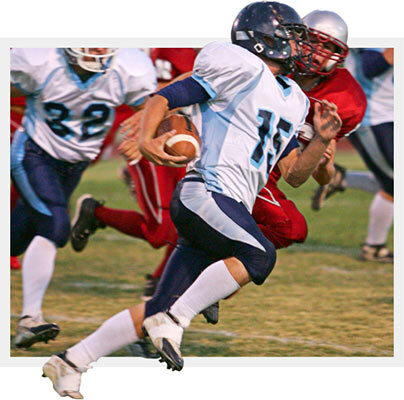 Use the selection tool of your choice to make a selection around the object(s) that will "pop out" of the image. Press "Ctrl+J" (Win) / "Command+J" (Mac) to copy the selection onto a new layer. Use the Rectangular Marquee Tool to drag a selection inside the photo which will become a smaller, cropped version of the image. 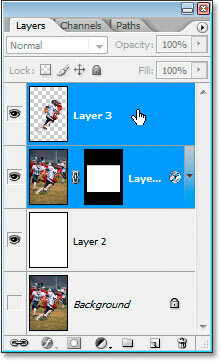 With "Layer 1" selected, click the "Add A Layer Mask" icon at the bottom of the Layers palette. 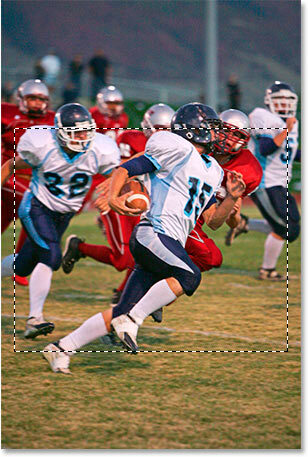 After adding the layer mask, only the part of the photo that was inside of the selection remains visible. We can now see the "popping out" effect taking shape. 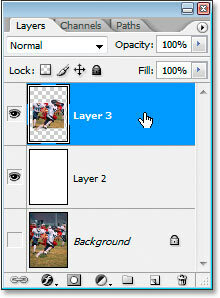 Step 8: Add A Stroke To "Layer 1"
Click the "Layer Styles" icon at the bottom of the Layers palette. Select "Stroke" from the list. 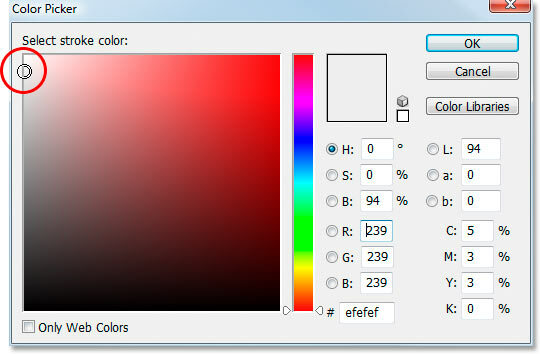 Choose a light gray for your stroke color. Click OK when you're done to exit out of the Color Picker, and then click OK to exit out of the Layer Style dialog box. The image after adding a stroke around the smaller photo in the background. 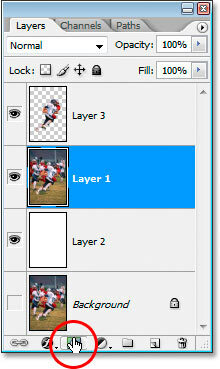 Select the top two layers at once in the Layers palette. The top two layers are now merged into one. Notice that your Stroke is no longer a separate layer style. It's now simply part of the image. 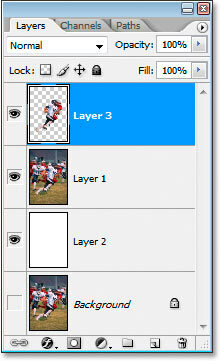 Click on the "Layer Styles" icon and choose "Drop Shadow". The "Drop Shadow" options in the "Layer Style" dialog box. I find the default Opacity value of 75% is a bit too strong, so I've lowered mine to 60%. Set your Angle to 120°, Distance to 5 pixels, and finally, increase the Size of the drop shadow effect to 10 pixels. Click OK to exit out of the Layer Style dialog box, and you're done! And there we have it! 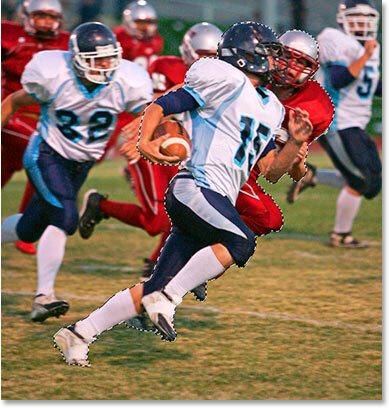 That's how to make your subject pop out of a photo with Photoshop! Check out our Photo Effects section for more Photoshop effects tutorials!